Train companies in the East Midlands are losing their battle with punctuality, according to a rail watchdog. The Strategic Rail Authority has revealed that only 47% of Virgin Trains, which run through Derbyshire and other parts of the Midlands, arrive within 10 minutes of the timetable. 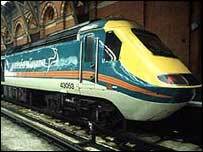 Midland Mainline's punctuality for October to December 2002 fell by 8% to 62.4% compared to a year earlier, according to the figures. 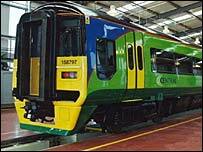 Central Trains, which runs a service from Nottingham to Birmingham, saw its punctuality fall by 6% to 61.5% for the same period. Nationally, the figures showed that train punctuality improved by about 2% - from 71% in the last three months in 2001, to 73% in the last three months of 2002. Alan Meredith of the Rail Passengers Committee for the Midlands said the performance was worrying: "Despite massive spending, services do not seem to be getting better." He said new schedules introduced last year caused havoc as track capacity in the Birmingham area could not handle the changes. These changes created bottlenecks which affected both Virgin Trains and Central Trains, which run many services through Birmingham. Mr Meredith said Midland Mainline had rolling stock and signalling problems during the period and was also affected by the remodelling of St Pancras Station. He said figures for the most recent quarter showed some improvement with Central Trains showing a significant improvement to 74% reliabilty, partly because the Birmingham bottlenecks had been ironed out. Virgin Cross Country - a service that covers most of Britain - was the worst performing operator, running only 47.6% of trains on time compared with 58.3% in the earlier three-month period. Both Midland Mainline and Central Trains have blamed the poor performance partly on adverse weather conditions during the winter. For long-distance services, a train is considered on time if it arrives within 10 minutes of its scheduled arrival. For London and South East operators and also for regional operators, a train is on time if it arrives within five minutes of its scheduled arrival.